It is a Clinton Christmas tradition. Hillary took Chelsea to see The Nutcracker when she was a little girl. Later Chelsea performed in the ballet. Now it is Charlotte’s turn! 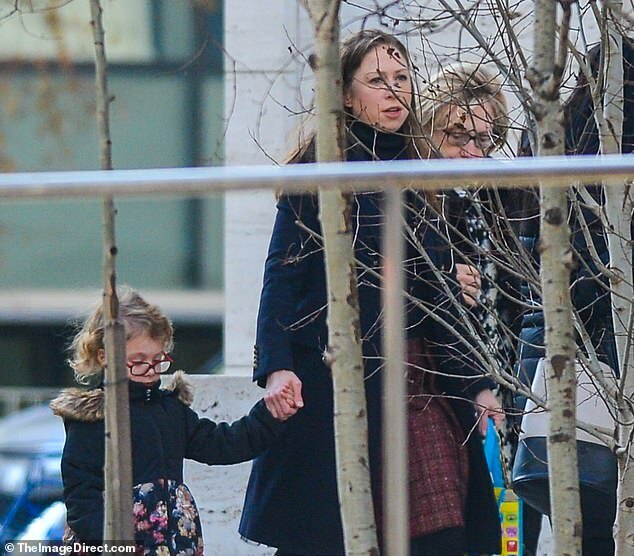 The Clinton girls enjoyed a holiday tradition on Wednesday as Hillary, Chelsea, and little Charlotte took in a performance of The Nutcracker in New York City. The trio was spotted at Lincoln Center on December 26, dressed up to enjoy a matinee showing of the Christmas ballet. After Aidan Clinton Mezvinsky was out and about a couple of times in the past few weeks, folks were wondering where Charlotte was and what she was up to. Well, Charlotte’s mom cleared that mystery up yesterday. Clinton 42 was out for a walk with a few of the family’s tiniest members: Tally, Maizie, and Charlotte. I does not get cuter than this. Bill and Hillary Clinton released this statement today. We are overjoyed to be grandparents again with the arrival of our grandson, Aidan Clinton Mezvinsky, born on Saturday, June 18, 2016. We are all over the moon as Chelsea and Marc welcome Charlotte’s little brother to the world and grateful for our many blessings. Chelsea and Aidan are both doing well and enjoying this very special time together. Hillary’s official photographer, Barbara Kinney published beautiful pictures from behind the scenes in Brooklyn the night of Hillary’s historic speech at the Navy Yard. Here are two special ones. Merry Christmas Mr. President and Mme. Secretary! So happy for your wonderful news and hoping we can help both of you make outstanding history in the next year! Seasons blessings to you and your beautiful, growing family! Wishing a very special Merry Christmas to everyone here! Thank you all for your hard work for Hillary. Hope your Christmas is full of warmth, love, and cheer! Here are Christmas greetings from the Clintons. We can send them holiday wishes best by donating to support their hard work. Every little bit helps! Give what you can, if you can. Best wishes for a wonderful holiday from me and the Christmas-Kitty-for-Hillary! Chelsea and Marc’s Wonderful News! Chelsea put her announcement on Facebook and Twitter, and it is adorable. Next summer, Charlotte is going to be a big sister! We are feeling particularly blessed and grateful this holiday season. Being Charlotte’s parents has been the most joyous, meaningful and loving experience of our lives and we are very excited about growing our family in the new year. The excited grandparents were quick to respond.